Tag line: "The most colossal conflict the screen has ever known!" 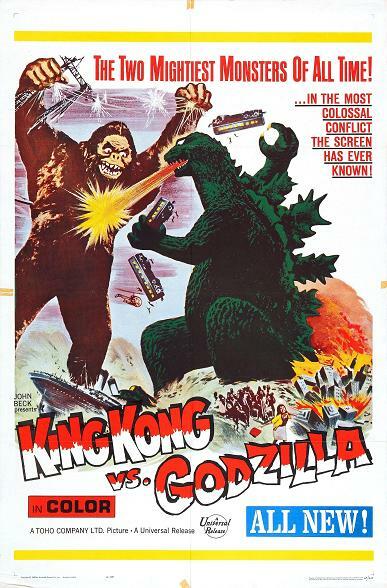 After scoring hits with both Gojira and Godzilla Raids Again in the 1950s, Japan’s Toho Studios decided to up the ante in 1962 by having Godzilla face off against another giant monster, and who better to take on this prehistoric fire-breather than the 8th Wonder of the World himself, King Kong? Hoping to generate publicity for the television shows that his company, Pacific Pharmaceuticals, are sponsoring, Mr. Tako (Ichirô Arishima) sends a couple of his employees, Sakurai (Tadao Takashima) and Kinsaburo (Yû Fujiki), to the remote island of Farou, where legend has it there lives a large creature that the natives worship as a God. Sure enough, the two men discover that Farou is home to the mighty Kong (played by Shoichi Hirose), a humongous ape that protects the locals from other indigenous monsters. Following a battle with a giant octopus, Kong drinks several large jars of berry juice (made from a special red berry found only on the island) that put him immediately to sleep. Taking advantage of the situation, Sakurai and Kinsaburo load the sleeping behemoth onto a makeshift raft and, tying it to the back of their boat, drag Kong to Japan. But Kong isn’t the only giant creature around; while patrolling icy waters, the U.S. submarine Seahawk accidentally struck an iceberg, inside of which was Godzilla (Haruo Nakajima), in a state of suspended animation. Once released from his frozen prison, Godzilla makes a beeline for the coast of Japan, unleashing his fiery fury on several small towns before setting his sights on Tokyo. The military, under the leadership of Gen. Shinzo (Jun Tazaki), throws everything they can at Godzilla, yet are unable to stop him. But with the mighty Kong also on the loose (seems the raft couldn’t hold him once he woke up), the authorities are hopeful that the two monsters, who are natural enemies, will destroy one another before the military is forced to use its most powerful weapon: the Atom Bomb! Still, there’s enough here of both Godzilla (looking more menacing than ever) and Kong (not the best ape costume ever created, but what are you gonna do?) to make even this edited version a worthwhile watch. Along with being the first time either one was shown in color, King Kong vs. Godzilla features some exciting showdowns between its title characters (their first melee is one-sided, but things get much more intense the next time they meet); and I especially enjoyed the scenes set on Farou Island, where Kong also fights an oversized octopus! 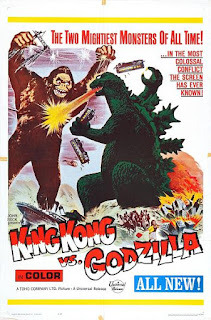 Godzilla would face a number of foes over the years (soon after this movie, Mothra vs. Godzilla was released), and while King Kong vs. Godzilla may not be the best of the bunch, it’s still plenty of fun.